Advent of Motorola Moto G has set a unique benchmark in the market of budget Smart phones, owing to its affordability, exceptional build quality and better performance. This Smartphone has not only received appreciation globally, but also brought Motorola into limelight again. But, with the introduction of Moto E, the economical Smartphone by Motorola that ticks almost all the right check boxes, it is really becoming confusing for people to choose between these two Smart Phones. So, here is a comparison of these two phones that will help you make wise decision. The 8GB model of Moto G comes with the price tag of 12,499/- INR, while the Moto E variant can be purchased @ 6,999/- INR only. This would help you save around 5,500/- INR, if you go for Moto E.
If you don’t prefer using front camera always and don’t play graphic intensive games, then Moto E would be the best bet indeed. Moreover, if you are a tech savvy and use front camera for video calling and chatting and prefer to capture moments, even in dark night then go for Moto G which comes with LED flash for shooting along with front camera. Undoubtedly, both the phones are durable and well-built, which are resistant to scratches and splashes. So, there is no comparison on build quality for both these Smart Phones. Though it may not be the key strength, but Motorola Moto E is the most economical Smartphone today that offer decent performance. But, users may experience minor delays while switching from one application to another. On the other hand, Moto G offers exceptional performance compared to Moto E and scores about 1.5 times more than all other young siblings. Beneath the hood of Motorola Moto E is the dual core 1.2GHz Qualcomm Snapdragon 200 processor, thus making the Smartphone sensibly responsive and snappy. But, in this category Moto G outshines Moto E, as it comprises quad core 1.2GHz Qualcomm Snapdragon 400 which set benchmark in performance. The performance of Moto E is still better compared to all other economical Smart Phones available today. The graphics are rich in games like, Dead Trigger, and Asphalt 8 with minor frame shutters and drops. Besides, multitasking is also possible. Since Moto G comes with snappier processor, so users will experience vast difference like, faster gaming and multitasking. The one area where Moto E surpasses Moto G is its support for expandable memory. Motorola Moto E is designed with 4GB Internal Memory, where 2.2GB is made available for users to download multimedia, transfer pictures, and applications. The users may also use micro SD card for storage. But, Moto G is designed with 8GB internal memory, out of which 5GB memory is available for end users and no option is there for expanding the memory. Battery life is better that last for a day, even after heavy use of phone. Motorola Moto G claims to offers its users a great experience with its brighter and bigger display with exceptional viewing of packs and angles in bigger pixels. The display of Moto E is slightly tint, so the image quality is not as brighter as Moto G. However, with its shortcomings, Motorola Moto E comes with the finest display in its category. Both these Smart Phones come with the latest operating system, Android KitKat 4.4 and the manufacturer claims that both these devices will further receive one more software update. Be free from all unwanted rumors, as both these smart phones offers exceptional software experience. So, this is the comparison between Moto G and Moto E, hopefully it will help you to make wise decision and select the correct smart phone by evaluating the specs and features of both these devices. You read the article. For sure you can go with Moto E.
First of all both handsets are booming in the Smartphone market. 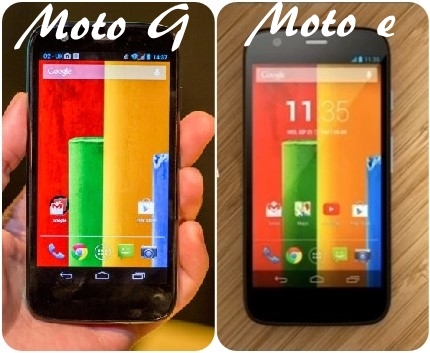 I think the Moto e is better than moto g because Moto e is the low budget phone with standard specifications. But one thing which I really miss in Moto e is the front camera.